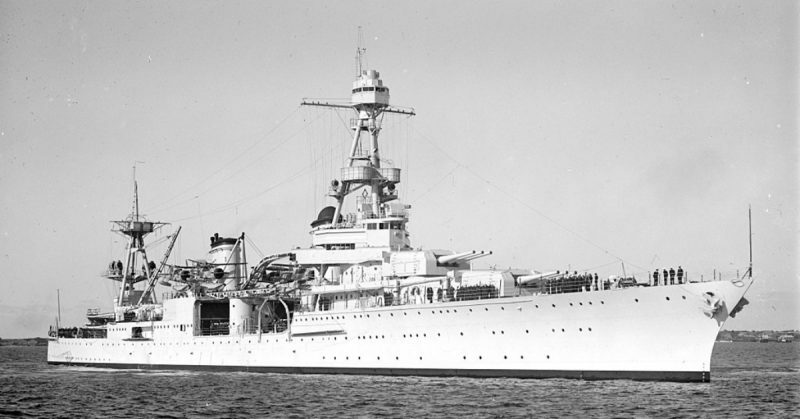 Starting out as a light cruiser and ending as a heavy cruiser, the USS Louisville (CL/CA-28) was very effective during its service in the Pacific War. Being hit by several Kamikaze attacks, the ship continued to serve until the end of the war. 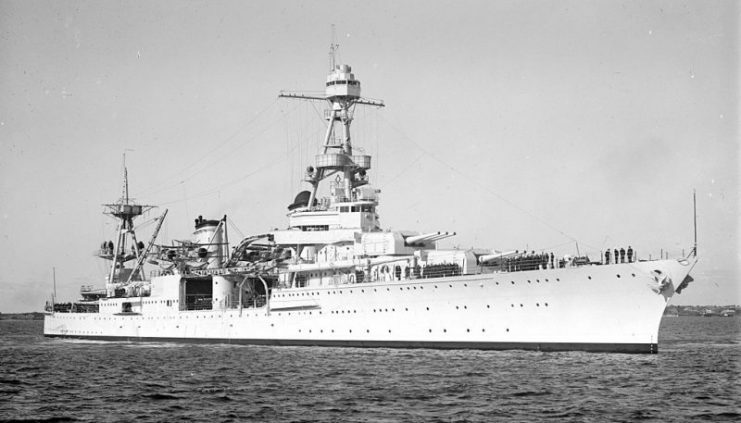 However, an end to the conflict also brought about the beginning of the end of its use as a heavy cruiser. After serving in postwar duties, the ship was decommissioned and sent to the Atlantic Reserve Fleet where it spent the next 13 years. It was eventually struck off the Naval Vessel Register and sold for scraps. At this point, the story of the Louisville should have come to an end. The U.S. Navy heavy cruiser the USS Louisville (CA-28) off the Mare Island Naval Shipyard, California (USA), on December 17, 1943. The ship’s camouflage scheme is probably Measure 32, Design 6d. Note that no hull number was painted on the bow. However, 60 years after her scrapping, it still comes to mind — not for its deeds on the seas, but for something completely different and unrelated to WWII. As a matter of fact, its reappearance under the limelight is closely connected to the most controversial nuclear tests in the United States’ history: Operation Plumbbob. 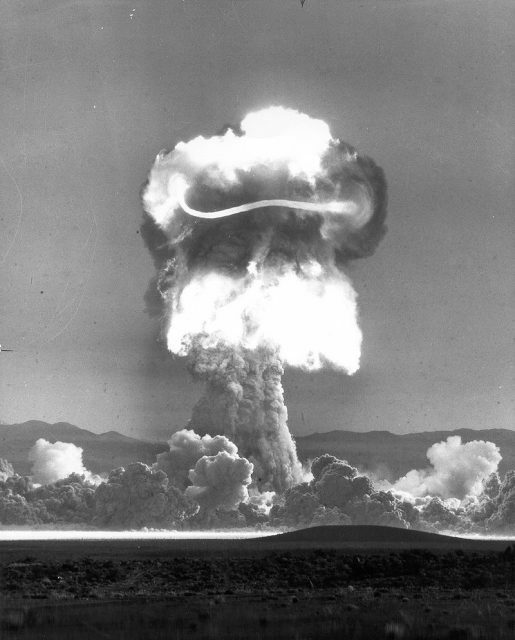 Operation Plumbbob involved the serial explosion of 29 atomic bombs in Southern Nevada. The nuclear tests were carried out to determine the effects of nuclear explosions on people, animal, and structures. 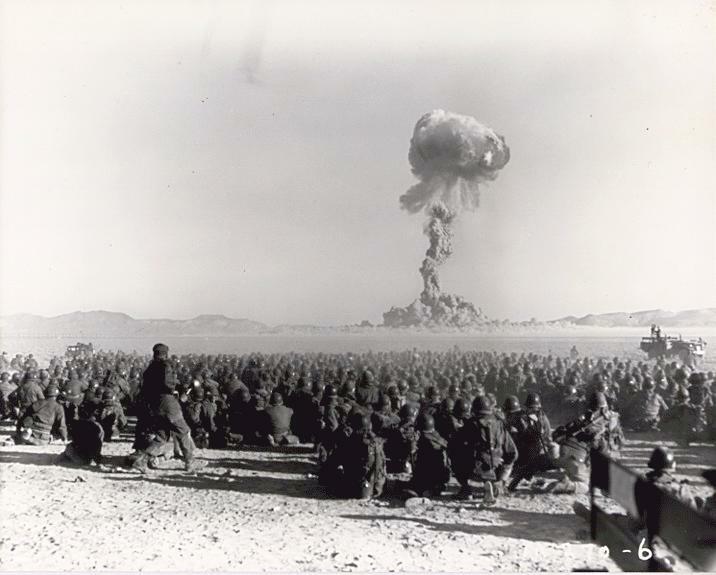 November 1951 nuclear test at Nevada Test Site. Test is shot “Dog” from Operation Buster, with a yield of 21 kilotons of TNT (88 TJ). It was the first U.S. nuclear field exercise conducted with live troops maneuvering on land. Troops shown are 6 mi (9.7 km) from the blast. The operation exposed about 18,000 members of the US armed forces and over 1,000 pigs to blast-effect studies. During that summer, 62 years ago, the skies of Southern Nevada burned with massive flames and thick smoke. The earth shook violently as one nuke after another exploded at the testing site. Between May 28th and October 7th, 1957, twenty-nine atomic bombs were detonated at the Nevada Testing Site. From miles away, mushroom clouds were visible, surging up into the skies. One of the survivors of the blasts was a WWII relic which had its origin in the US Navy. Four years ago, during a visit to the Nevada Testing Site which is now the Nevada National Security Site, physicist Rob Hoffman noticed the odd WWII relic in Area 2 of the facility. According to Hoffman, at first glance, it looked like a weird-looking trailer. But as he got close to it, he came to recognize what it was: a turret from a US ship. It was, in fact, Turret No.2 of the heavy cruiser USS Louisville. Perhaps Hoffman had been able to recognize the large, metallic structure because he hailed from a family of U.S. Navy personnel. 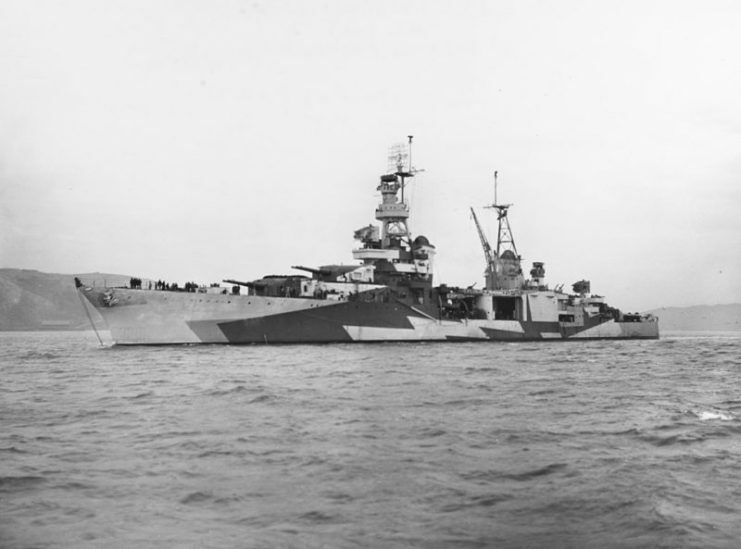 During WWII, the US Navy employed heavy cruisers in the darkest, most intense sea battles. So how did this essential part of a Navy ship end up there? During its service in the Pacific War, the Louisville was hit on multiple occasions by Kamikaze planes. 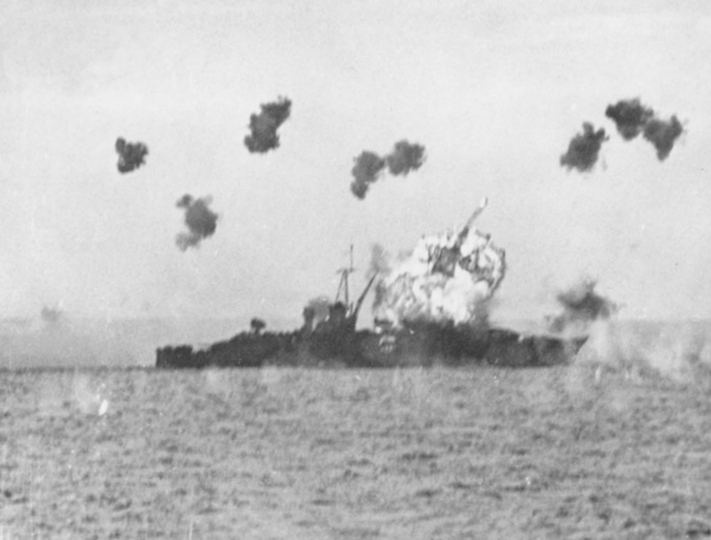 During one of these Kamikaze attacks, Turret No.2 was damaged. The damaged turret was removed and replaced by a new one. The original turret was subsequently repaired and fit for use again. But when the war ended, it was no longer required by the Navy, so it was left in the shipyard to gather dust for over a decade. From there, the turret found its way to the Nevada Testing Site where a different use was found for it. As Hoffman stared at the turret, he realized that the barrel on the turret was not a gun, but a rotatable radiation detection device, used in the collection of data on nuclear tests. During the Plumbbob operation, workers needed to construct bunkers filled with detection equipment during each test. The connecting coax cables were up to a mile long and needed to be buried 20 feet (6 meters) underneath the ground to avoid being melted by the blasts. This was not only time-consuming, but it was also costly. As a result, there was a need for a device with a reasonable line of sight which could safeguard the detectors while pointing at each of the devices as they got scattered around. This is all gobbledygook to a layman, but contractor Erv Woodward knew what he meant when he voiced the idea. He pointed out that the new device would save money and energy as the workers would no longer need to build special-purpose bunkers all the time. So Woodward and his colleagues went to the Mare Island shipyard in San Francisco where they selected this war-stricken turret. They transported it all the way to the Nevada Testing Site, driving along Interstate Highway 15, past the curious stares of the public. After the 203 mm gun barrels were removed, the detection device was put together and set on a stand that allowed it to rotate in circles. 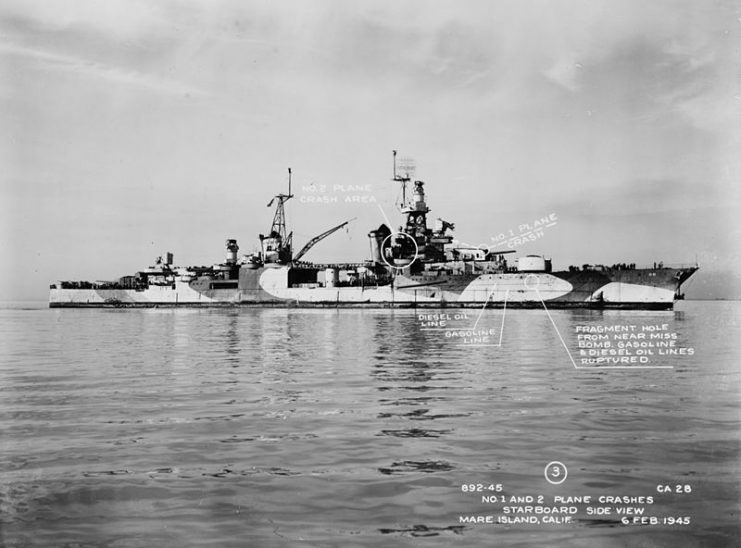 The U.S. Navy heavy cruiser USS Louisville (CA-28) arrives off the Mare Island Naval Shipyard, California (USA), on 6 February 1945 to receive repairs for damage inflicted by two Kamikazes a month earlier. During the tests, the turret collected radiation data from each nuke explosion, ultimately surviving the intense blasts. Today, the turret sits once again in obscurity. It is worn out by decades of being baked in the searing heat of the Mojave desert. 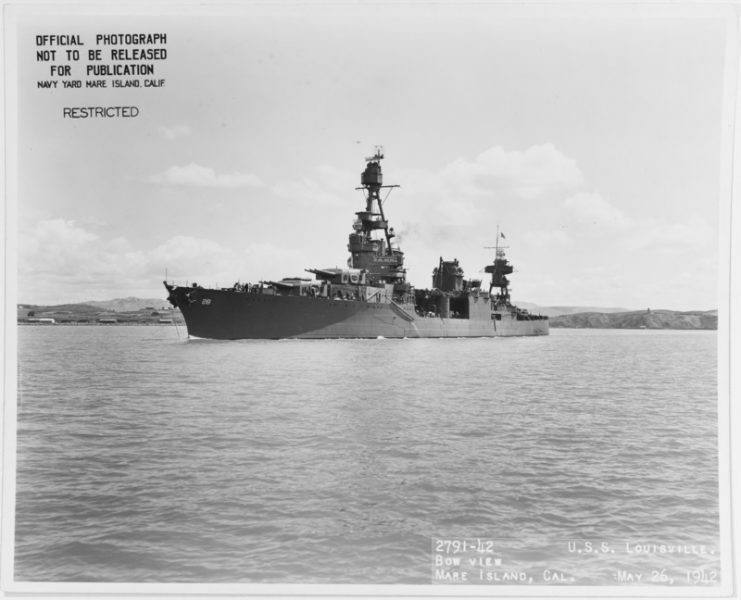 USS Louisville (CA-28) off the Mare Island Navy Yard, California, 26 May 1942. Originally, nobody knew from which ship the turret had come. The only information available was that it had been obtained from a shipyard. Only when Rob Hoffman turned detective did the origin of the turret come to light. 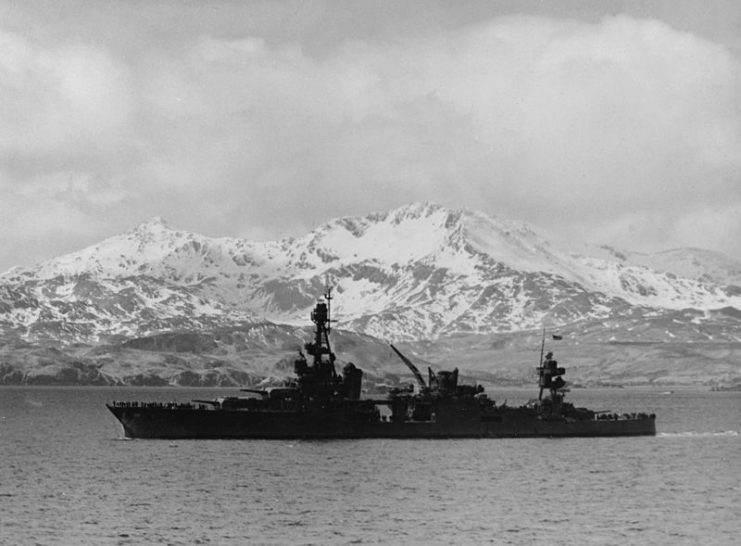 For days, Hoffman analyzed the scars around the metal and drew parallels between WWII records of heavy cruisers. Patiently and carefully, he narrowed the origin of the turret down to the USS Louisville.